Greg Barrett accused Lance Hindt, now a school superintendent in Katy, Tex., of bullying him when they were junior high school students. Greg Barrett walked up to the podium, striding past the empty rows of chairs behind him. It was a Monday night, and attendance at the Katy Independent School District school board meeting was sparse. Not that it mattered. As Barrett began speaking, his gaze was focused on the district officials seated in front of him — in particular, on Lance Hindt, the superintendent of the Houston-area district. He and Hindt had gone to school together in Katy, Texas, more than three decades ago, Barrett explained. He then launched into an account of how he had been targeted as a child because of his legal name: Greg Gay. One day at lunch, Barrett said some classmates assaulted him and shoved his head in a urinal. He remembers lying on the ground in fetal position — with a busted lip, and covered in urine — as the kids kicked him, he said. When it was over, Barrett said, he rinsed his face off and went “straight to the principal’s office.” The principal reassured him the kids wouldn’t always be like that, and sent him home, Barrett said. The experience left him despondent and contemplating suicide, he recalled. Barrett threw his hands in the air and walked away from the microphone, leaving the room in stunned silence. From the elevated school board seats came some murmuring. A small laugh could be heard. During his public comments, Barrett said he had started in the district in 1975, with Hindt, then graduated in 1983. Hindt confirmed in his statement that they had gone to the same middle school but not to the same high school. Barrett did not immediately respond to interview requests Tuesday. A man who answered a phone number listed for him identified himself as Barrett’s father, and said he could confirm that his son had been severely bullied at school growing up. Barrett told the Houston Chronicle that he now uses his mother’s maiden name, and that he simply wants Hindt to apologize for what had happened, not to lose his job. Still, Barrett wasn’t encouraged by Hindt’s response at the meeting, according to the Chronicle. 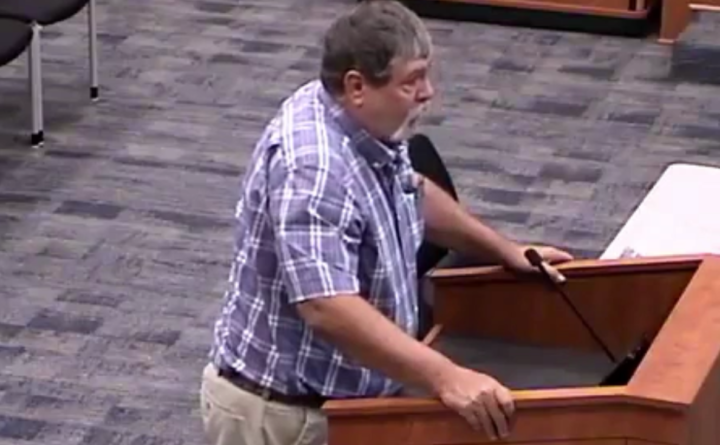 Hindt indicated in his statement that bullying is not taken lightly in Katy Independent School District, which enrolls more than 75,000 students and is among the fastest growing school districts in Texas.